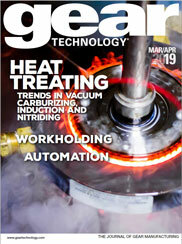 The article "Gear Chamfering Robot" appeared in the January/February 2011 issue of Gear Technology. Banyan Technologies introduces a robotic chamfering device suitable for deburring, chamfering and radiusing the edges of slew bearing ring gears. The article "Gear Chamfering Robot" should appear in the box below, but if you do not see it, you can download it here.